Our current horses are as different from each other as there are daily jobs in the sport. We have different horses of varying performance levels and bloodlines in our barn. In our daily work and together with our partners we select for motivation, scope, intelligence and last, but not least, heart. Success is possible only when all factors combine perfectly. An overview of our current horses is found here. Our previous grand-prix horses wrote horse sport history. They showed heir true colors in numerous Nations Cups and Championships for Germany and without the strong spirit of those ambitious top athletes we would not have been as successful as we were – we associate their names with so many breathtaking memories. Find out more about our world-renown previous grand-prix horses here. For Pleasure was ambitious and good-natured, and he was always focused while training and competing. His personality and success have made him an extraordinary horse. For Pleasure was a breeding stallion and has produced successful offspring competing at the Grand Prix level. For Pleasure was Marcus’ most successful horse. Together they have won several medals and achieved innumerable victories and placings. For Pleasure was retired from the sport at the “CHIO 2006” in Aachen in May 2006. He was a breeding stallion at home with the Ehning family. Karina Ehning remained in charge of For Pleasure, her favourite horse in the barn, and ensured a pleasant retirement, a special treatment for an extraordinary horse. His favourite song was, by the way, the German national anthem and his nickname was “Freddy”. Anka was only 5 years old when he came to Marcus’s barn. He showed her in the classes for young horses and also competed her successfully at the Bundeschampionat. As a 7 year old, in December, she already jumped her first Grand Prix and was highly placed. She continued to be one of the most dependable horses with Marcus, due to her very good ridability, scope and carefulness she was started often in the biggest classes. Anka crowned her career with the win at the World Cup Final in Las Vegas in 2003. But also in the years after that she won many classes, among them the Nations Cup in La Baule. After her retirement she was a broodmare at the Ehnings barn for 7 years and gave birth to 5 foals. Sandro Boy only arrived at Marcus’ barn as an almost 10 year old and was carefully prepared to jump the big classes in 2003. Due to his very scopey jump the actual jumps were not a problem, the big leaps caused him difficulty keeping to the distances, however. That did not stop him from winning the Grand Prix of Frankfurt that same year. In the years to come he added many wins in Grand Prix as well as the win at the Nations Cup Final in Barcelona. The most outstanding victory in his career, however, is the win at the World Cup Final in Kuala Lumpur in 2006. After 5 clear rounds he was deservedly declared the winner. His incredible scope and careful jump characterised this exceptional and stong-willed stallion until the end of his fantastic career. Even after the last round of his career, the Grand Prix of Munich in 2010, he was leading the lap of honor as the winner of the class. Noltes Küchengirl started her career as Lord’s Classics with Johannes in the saddle. Her outstanding quality was already evident with Johannes, who won the Grand Prix of Hamburg with her in 2005, being only 8 years old. In the following year Marcus competes Noltes Küchengirl very successfully from the beginning on. After wins in Leipzig and Bordeaux the powerful mare wins the Grand Prix of Aachen and, also not only the Nations Cup in La Baule, the Grand Prix of La Baule, also! The crack in her career due to the “stamp” at the World Championships in Aachen 2006, caused by a rider error from Marcus, by no means correlates to her strength of character. In the years following the highly sensitive mare proves her impressive form with wins in many Grand Prix as well as Nations Cups. 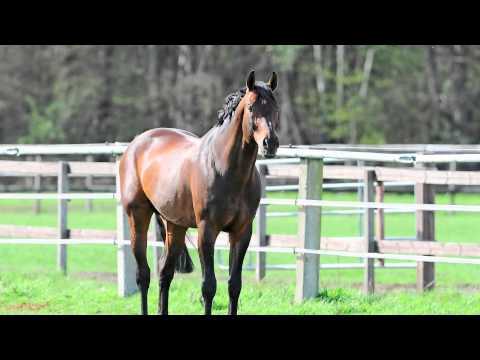 After 9 years competing at the highest level, “Küche” is now enjoying her much deserved retirement and is expecting a foal by Comme Il Faut next spring. At the start Sabrina was ridden by Johannes in the classses for young horses and also shown successfully at the Bundeschampionat. Johannes also competed her in the first Youngster classes as a 7 year old before Marcus took over in the summer of 2006. He continues showing her as an 8 year old in the Youngster classes. In the years to come Sabrina becomes one of the most dependable and most profitable horses in Marcus’ stable. Among other classes she has competed twice at the World Cup Finals. Her lifetime winnings are already more than 800.000,- Euro. Plot arrived at Marcus stable in the summer of 2008. The two of them quickly found their routine that year and won some big classes as well as jumped their first Nations Cup for Germany with a double clear round. The dependability of Plot Blue makes him the star in the string of Marcus’ horses. The reward for all the hard work is the win of the World Cup Final 2010 as well as the Gold medal with the Team at the World Championships in Kentucky. Plot Blue is regularly found winning classes at the biggest competitions all over the world and helps win Nations Cups for Germany. His lifetime winnings are more than 1.2 Million Euro. He was retired from the showjumping career in Geneva in December 2015. Our breeding stallions represent quality and proven athletic heritage. Renowned sires have proven success in their own right and will pass on their talents and motivation to the next generation. Offspring of our sires are competing very successfully in national and international competitions. Here you see the overview of our breeding stallions – if you have questions do not hesitate to contact us for more information. 2014 2nd place in an international class with jump-off, 1,50m in Paderborn. 2014 2nd place in the Grand Prix of Dortmund.